Happy New Year from Museums Now! It's cold and snowy where I am tonight. Apologies for the lack of posting in recent weeks- I've had some unexpected travel. Didn't want the New Year to ring in before wishing you all well. 2008 ended with good news and sad for many– and not only in our industry. As I stand on the threshold looking both ways before crossing, I step forward knowing that we have been through many tough times, and look ahead with optimism towards 2009. 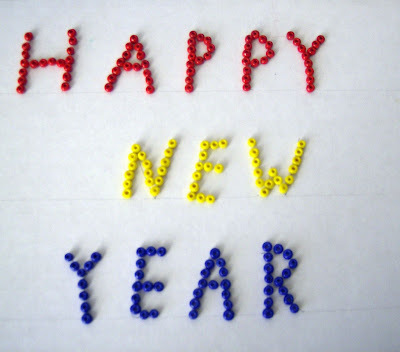 On behalf of all of us at Gyroscope, I would like to wish you all the best in the New Year. Thanks to Sally Mahoney for the CC rights to the picture. Labels: "2009" "happy new year" "gyroscope", "maria mortati"
"I also wanted to take a moment to share my own story of how I became a green builder. Back in 1991..." [he goes on to talk about first jobs in this area, working for Clinton's White House, learning from the Godfathers of Green: Hawken, Lovins, Browning, and Picard] "...It wasn't very long before I got a cold call from a guy named David Gottfried who wanted to talk about this idea he had for a green building council. When he said it could change the world. I thought he was crazy. But I was already hooked, and so agreed to be USGBC's Founding Chairman. We were little and struggling for the first seven years, and there were many times when we weren't sure we'd make it. But David was right. We can change the world. And here we are proving it each and every day." Seven years of struggling. Wow- but they are doing well, and it's taking hold- in our industry and others. 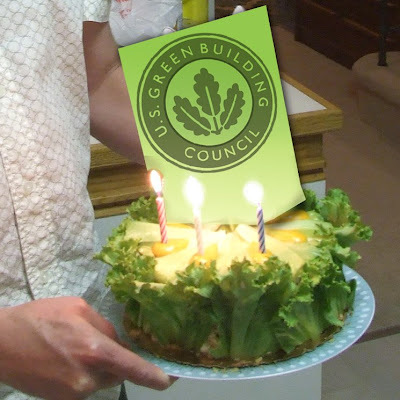 Thank you, USGBC, and good luck. ...that's not the sort of thing that will inspire a potential donor or warm the cockles of one's museum-loving heart. So I'm putting a call out to the museum world to ask: what are some good quotes that you think do a good job of summing up the value of museums? [Hi, Scott posting again] To follow up on the material certification topic I started last week, this week I will be talking about Cradle to Cradle certification. "Cradle to Cradle" is a term coined by William Mcdonough and Michael Braungart to describe a pretty radical way of thinking about the life cycle of a product. Cradle to Cradle is about creating products that are designed for closed loop systems that create value and are healthy and safe. Often as a product moves through it's life cycle it goes through a dramatic degradation process and it's value becomes trapped in useless waste or worse yet it harms other natural systems as it is used. The bigger goal here is to design products that beneficial when they are used. He makes the point that growth in nature or a child is a good thing and so why can't growth related to development also be positive? This thinking turns the minimizing approach of sustainability it's head says that consuming product should play a positive role in our environment and society. The funny thing is that while this will require a radical reworking of the way we think about making and using products, it allows our consumptive urges to continue to run wild. For me, this is both the most promising aspect and the biggest danger. Our consumptive desire has been a tough one to shake (if not impossible) and while the bright future of good products sound great, in the short term we will have to do less. Anyway William McDonough along with Michael Braungart have written a really good book covering this approach and have followed that up with a certification program that evaluated products against their criteria. Mc Donough's website has videos and writings that are worth spending some time on. One interesting development with the LEED certification is that the next version (New Construction V2009) it will contain life cycle assessment as part of it's criteria. I will be interested to see if they start embracing ideas similar to Cradle to Cradle and then I wonder how such a potentially wide reaching idea will impact their other criteria. [Hi Scott Moulton posting.] With all the focus on "green materials" I thought it would be useful to talk about a few of the certifications that relate to materials . I'll start this week with certification for wood. Ok first I'd like to make a pitch for solid wood. It is a beautiful, durable, natural material that can be sustainably produced and will biodegrade. After building furniture with it for about 10 years I am still totally enamored with solid wood. (plywood is another matter) So if you are like me and want to use wood and wood that is sustainably forested you will be seeing the logos of FSC and SCS and trying to make sense out of what they mean. The Forest Stewardship Council is an independent, non-governmental, not for profit organization established to promote the responsible management of the world’s forests. They are the ones who set the most widely accepted standard as to what it means to call something sustainably forested. They have established 10 Principles and 57 criteria that address legal issues, indigenous rights, labor rights, multiple benefits, and environmental impacts surrounding forest management. I've always been impressed by their commitment to a rather broad interpretation of what sustainable forestry means. A lot of the exotic woods come from some troubled regions of the world so along with ecological concerns come some even more serious issues around the impact this trade has on the local people. SCS stands for Scientific Certification Systems and they provide independent third party certification for everything from coffee to flowers. You can see a wood product with both the FSC and SCS logos or only one which has always been a bit confusing to me. 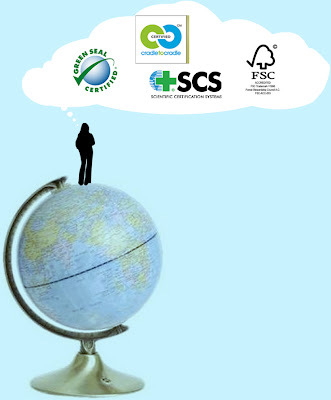 The thing to remember is that SCS is primarily a company that verifies environmental claims and performance based certification. So SCS verifies that a forestry practice adheres to the guidelines set out by FSC. Now things get messy because SCS also has their own competing guidelines which they will then verify and you can have the SCS logo show up. In addition, they offer Chain of Custody Certification, Life Cycle Assessment (I'll get into this next week) and single attribute certification for terms like salvaged recycled recovered and so on. All of this points to the interesting fact that while FSC certainly has established itself as the standard, there are differing views on what "certified wood" can or should mean. It is worth investigating the SCS website. I'm still trying to get my head around the extent of everything they are involved in and it raises interesting questions. Is it ok that these "independent third party" folks are also helping Starbucks and Home Depot set up eco guidelines that they will then use as marketing? While it may not be the purist path, I think this work with huge corporations is a really promising development. As ecological concerns become mainstream they will become part of our broad economy the commitment to verification and standards is critical to preserving some meaning behind terms like of "eco, sustainable, or green". This week, while looking for a museum-related image, I came across the above pictures of Joe Geranio. Joe is a an administrator of the Julio Claudian Iconographic Association, and is generally in love with its iconography (see his website for more). His story is a great example of museum "Affinity Groups". Above you'll see him posed between 2 busts-- photos taken 23 years apart. I love this story for so many reasons- the fascination of seeing him change over time, his fascination with the subject, and the fact that he could go back to the same institution all those years later and take that picture. Finally, reading the comments on his Flickr page made me happy that I wasn't the only one who cared. The Minnesota Local History blog has a great post and comments that talk about the need for and types of Affinity Groups that they have had experience with. These groups can be the lifeblood of history museums today. John Durel and Anita Nowery Durel wrote about this extensively in their paper: "A Golden Age for Historic Properties". I encourage you to read it- it's a great article. As you may suspect, affinity groups are groups of people who formally or informally have a relationship with an aspect of your museum. Joe and his "Julio Claudian" cohorts are an affinity group because they are passionately interested in this aspect of collection, and will come back to it again and again. 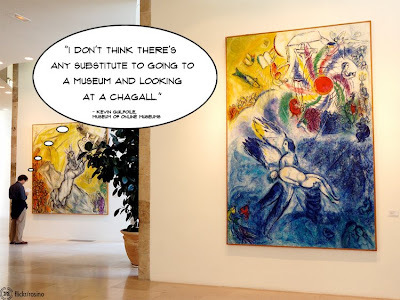 They are part of the holy trinity of museum visitors. The attention being paid to fostering repeat visitors is worth it, and something I will definitely write about in the future. The fact that I "found" Joe via a random search on Flickr is also a wonderful story. I owe a debt of gratitude to the Creative Commons license on Flickr. I use it for images on this blog when my photo library fails me. Like a trip to the bookstore, it's led me to some interesting people and places as I look for one thing and often discover another. "...everyone knows ice is cold but when people press their hands onto it within the context of the sinking of the Titanic, they get a memorable sense of how unpleasant it would be to bob in water containing icebergs. And probably everyone already knows they get a little squirrelly in a small space but being in a confinement exhibit would create a memorable bit of fear. And everyone knows the body is made of stringy muscles but when they realize they are looking at real dead people in a BodyWorlds exhibition, those weird-looking bits take on a whole new significance." It isn't always easy to craft those profundities. For example, there are whole teams of people working very hard on making Nanotechnology relevant to the public. In addition, not every experience in your museum can or should have the same level of deep impact on the visitor. There need to be peaks, valleys, and plateaus of engagement and reflection. It's the orchestration of all of these things that makes the overall experience resound... and live on in the visitor after they have left. That after-the-fact mulling over is where learning also happens. Giving them a relevant hook boosts the likelihood that a memorable connection is made. "If you add up the attendance for every major-league baseball, basketball, football and hockey game this year, the combined total will come to about 140 million people. That's a big number, but it's barely a fraction of the number of people who will visit American museums this year. Museums are big business, attracting... 850 million people annually"
The second edition profiled Alex Nyerges, director of the Virginia Museum of Fine Arts who has a museum dream life. The comments were predictable: " Mr. Nyerges is not the typical museum director in America" (Scott Wands). Yes, his story is exceptional- but part of the reason we don't take home the big bucks is a trade-off- we do get to do interesting work, with topics that stretch and grow us daily. I think there are several more shows coming, and like a CNET review, I'll wait til the end to see what the sum is. This series has got me looking for good museum-related podcasts and radio shows. If you know of any, feel free to send them my way: maria [at] gyroscopeinc [dot] com. Thanks. * For institutions facing tough times, the AAM has posted some guidelines on their site here. When I worked at the Exploratorium, I was often asked the question "what are the top 5 exhibit here?" or at a dinner party I often get asked "what's the best exhibit you've ever seen?". It often gets me to wondering if the director at the MOMA is ever asked "what is the best work of art you have"? Or if the president of Stanford is asked "what's the best class at your school?". I know it stems from a genuine desire to make sense of what often seems (especially in the case of the Exploratorium) an overwhelming amount of info and experiences. However, exhibits are as unique as the person standing before it. They are also developed for specific reasons, and are often not intended for everyone-- but because they live in a public space, they need to be understood by all, if not engaged. 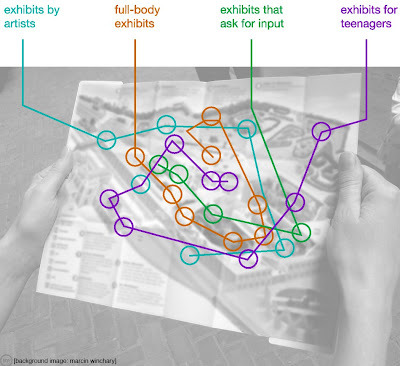 When I worked there, I proposed an idea of creating curated podcasts or maps, where visitors could select a filter for what they wanted to experience, such as: - exhibits for teenagers - full-body exhibits - exhibits by artists ...and so on. In addition to to having the museum experts make these determinations, what about letting visitors leave their own maps and trails behind in a museum… much as they do on-line? The nice thing about this approach in a museum vs. in an on-line context, is that you still get to "browse" and be exposed to exhibits that may not be on your "list", since they may be adjacent. How could we make visitor-experienced floor plans? How might we allow visitors to get a sense of what their peers or someone they aspire to be “liked” or “learned from”? Have you seen this working somewhere already? Did you participate?